I am continuing daily blogs in November toward the goal of sharing some of the recipes and traditions in our family for 100 years during the Thanksgiving and Christmas holidays. I welcome your sharing of traditions and comments about the blog topic. Today was a semi-cloudy election day in Charlotte, NC. We will have a new mayor tomorrow. The trees are nearing peak here. So spectacular that we saw Fall colors come alive in the mountains and then come home to the city and see Fall come again…. Awesome! THIS SCENE IS NEAR MY HOME in Charlotte, North Carolina, and on the path of our two mile walk we travel several times a week. Most of our walking is on the greenway, but we take this shortcut through a nearby street to our house. My parents lived in an apartment near here when they sold their Indiana home and moved to be closer to family. Each time I walk it, in my mind’s eye I see Dad, walking his dog Casey down this street. I put my thoughts about them into a poem. life without work at the electric power plant. and he named you Casey. you gave him reason to look forward to the day. Your daily walks kept him in shape. an afternoon nap with you tucked under his arm. you hit the showers together. after your bath, waiting for him to shower. as he sang your favorite song, “Home on the Range”. from feeding pets at the dinner table. while his memories dimmed with dementia. – as long as he could remember you. This is one corner of our back yard, as seen from the back of our house. 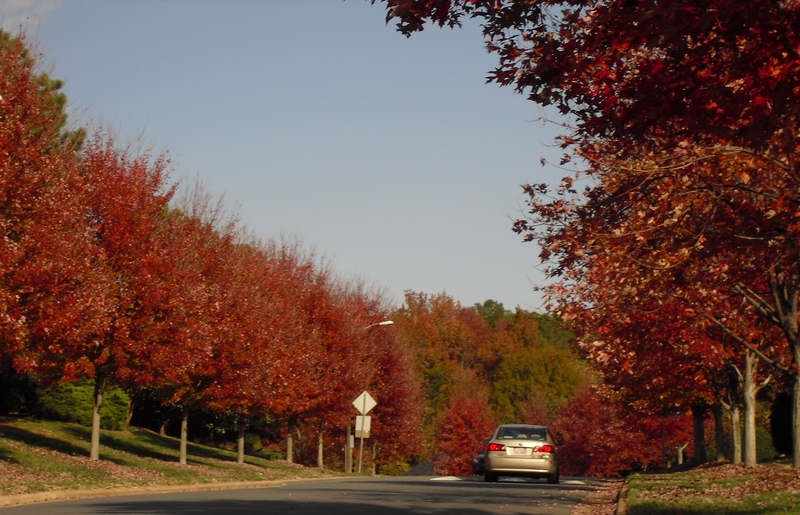 Charlotte is known as the city of trees and we have our share t enjoy. It is now November and I am engaged in planning our calendar for the coming holidays. I am also getting out some of the decorations for Thanksgiving month. I will show those tomorrow. Another busy day. We had crock pot roast, cooked slowly with onions, potatoes, tomatoes, brussel sprouts, mushrooms and some white wine I had on hand. 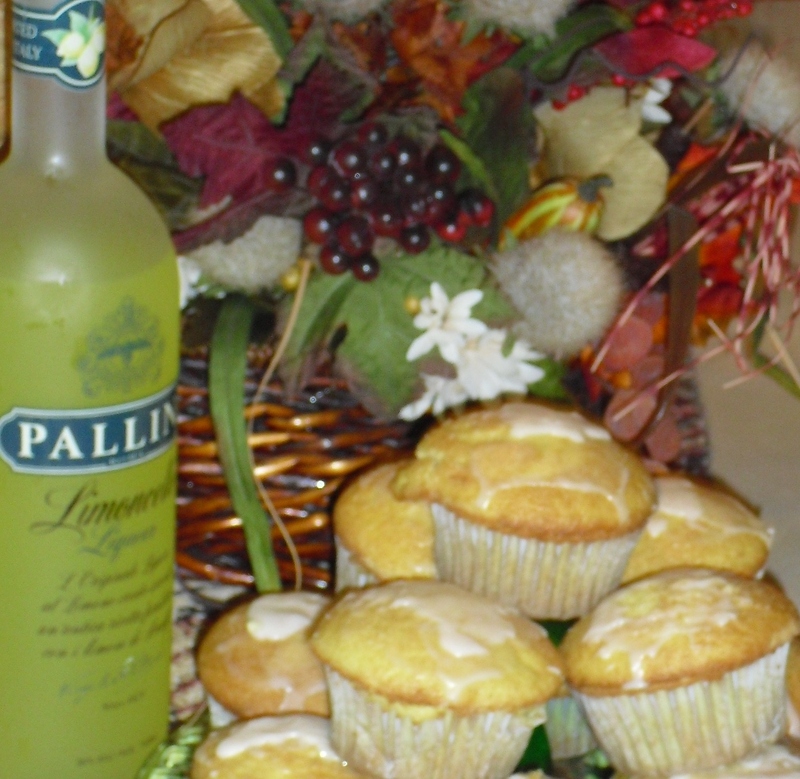 I make some lemon cupcakes with limoncello icing for dessert. This time I just used a box cake, and added lemon juice and yogurt to the mix of other ingredients for the cupcakes – and the touches of icing is just limoncello, confectioners sugar and some powdered lemonade mix (crystal lite) for tartness. MY HOLIDAY PLANNING IS UNDERWAY. HOW IS YOURS COMING?